An Aussie backpacker’s clever social media campaign efforts have resulted in his wish of returning home to devour a Guzman y Gomez (GYG) burrito bowl coming true. 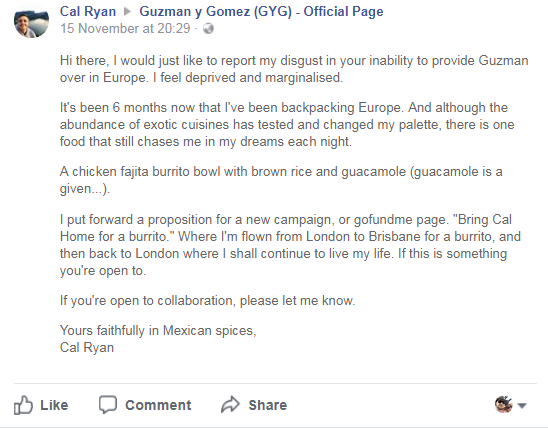 Cal Ryan (pictured above), who is currently backpacking through London, wrote a post on GYG’s Facebook page last week complaining about the Mexican fast food chain’s non-existence in Europe, and that he had not tasted GYG’s goodness for six months. Ryan, who works in media, started a campaign and hashtag to get GYG to #BringCalHome for a burrito. GYG challenged Cal to get 3,000 comments and 1,000 shares on his Facebook post, and the company would fly him home. And sure enough, Ryan achieved the goal set out by GYG… in less than 24 hours. “On November 30th, Cal will be at our 100th restaurant celebration and Free Burrito Day in Burleigh Heads, which is a lot closer to Mum and Dad’s than London is! He’ll also get a free family lunch at Albany Creek!,” a website post by GYG said. It’s perfect timing for Ryan, whose brother and his fiancé had a baby two weeks ago, and his best friend’s 21st birthday party is on 8 December, which GYG has said it will make sure he attends.